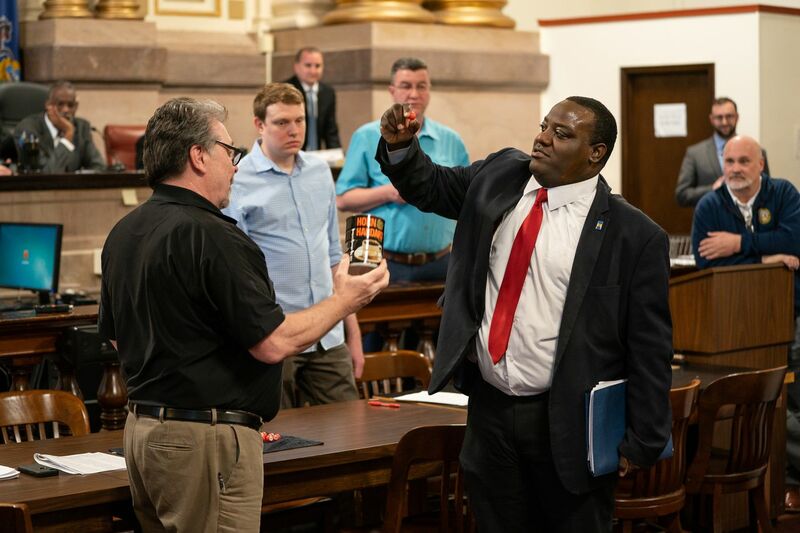 Devon Cade, right, draws for ballot position out of the coffee can in room 676 of City Hall, in Philadelphia, Wednesday March 20, 2019, and Kevin Kelly, Acting Supervisor of Elections, on the left. Devon Cade, the City Council at-large candidate who collapsed in court Friday just before a judge was to hear legal challenges he filed against the nomination papers of 30 Democratic competitors, on Monday dropped all those cases. That might not be the end of it. Lawyers for about half of the candidates challenged by Cade signaled they might ask the court to order him to pay their legal fees and other costs. Cade, 34, said he was “really shocked” to hear the lawyers would seek sanctions in his “moment of despair, with my health between life and death.” He attributed Friday’s collapse to high blood pressure and said he is “slowly but surely” feeling better. Cade also said he is still “praying on” whether to remain a candidate in the May 21 primary. He collapsed Friday while setting up that equipment and was taken by ambulance to a hospital. In other cases considered Monday, a judge rejected a petition from Democrat Sheila Armstrong to reinstate her primary challenge to the candidacy of City Council President Darrell L. Clarke. That challenge was not properly filed with the city’s Board of Elections by the March 19 deadline. A challenge to Armstrong’s nomination petitions on Monday ended in an agreement that she did not have the required minimum of 750 valid signatures from registered Democrats in Council’s 5th District — which covers parts of North and West Philadelphia — to qualify for a ballot spot against Clarke, who is seeking a sixth term, according to attorney Charles Gibbs. That means Clarke will run unopposed in the primary, after another Democratic challenger, Omar Woodard, withdrew from the race on March 15 due to problems with his petitions. In Council’s 1st District, which stretches along the Delaware River from South Philadelphia north toward Kensington and Torresdale, Democrat Lou Lanni on Monday withdrew his challenge to Councilman Mark Squilla. Lanni, a candidate in the primary, agreed that Squilla had enough valid signatures to remain on the ballot, according to Kevin Greenberg, Squilla’s attorney.